HomeLifestyleTeensElections are important, find out why! 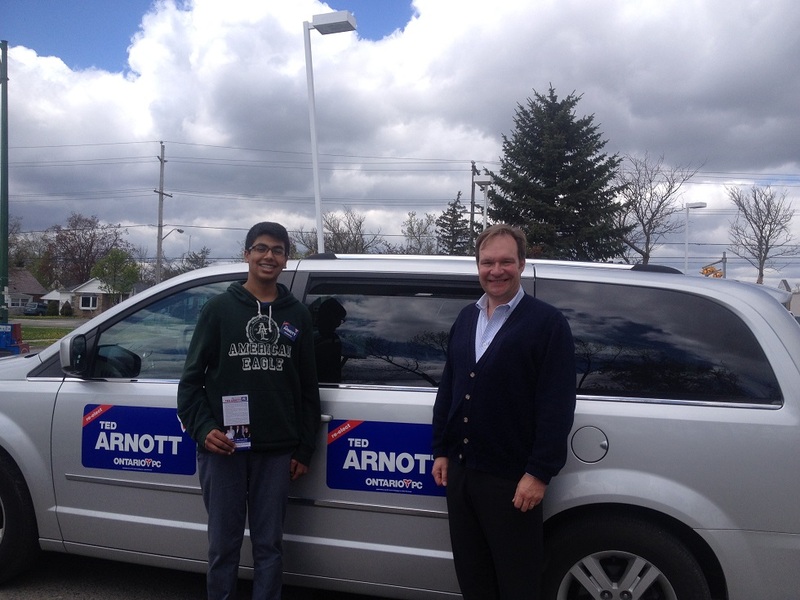 On a chilly morning of Saturday, May 17th I had the chance to canvass for the Hon. Mr. Ted Arnott, MPP in Acton. It was an interesting experience as I hadn’t done it for a while since the bi-election in Kitchener-Waterloo in Ontario where I canvassed for Ms. Tracy Weiler of the PC party. However this day was special as it was the first time I can canvassed in my local community of the Town of Halton Hills. There was a great turnout and many came to help in the campaign. We covered a lot of ground in an hour and a half. With five cars we reached approximately 5000 people. Of course this is great as the more people we could reach and influence – the better. Canvassing means to go out and promote the political party you are part of. We do this by not only handing out info-pamphlets on the candidate and party, but by talking to the people in the houses and answering questions. It is an important way to bring in more voters for the political party you support. It also increases awareness on why elections are so important. We need to understand that elections are very important because it is the citizens way to take part in who is being elected for office whether at local, provincial or the national level of our country. We need to know whose hands the country is in or whose hands we would like our country to be in. As a politician said recently at the March for Life in Ottawa, “We are only the landlords of Parliament, it belongs to you, the citizens.” Wise words from this good politician. I was able to witness first-hand the great things that everyone says about him. He asks himself on a routine basis, “What’s the most important issue?” His response to that – during the election – is to get people to think in terms of who is the right person who will be able to represent the riding of Wellington/Halton Hills. Mr. Arnott also stated that the big issues in the riding currently are: jobs, economy, and bringing government spending under control and helping reduce the cost of hydro bills. I asked Mr. Arnott, “Does the liberal government deserve to be re-elected?” To this statement, he said that they don’t, referring to the recent scandals with E-health and the Ornge fiasco. These scandals, as we all know, have definitely made life harder for the taxpayer as hard-earned tax dollars were misused. The Liberals cannot deny this as there is much proof regarding what they did. This is currently being investigated. Mr. Arnott also said, “The Liberal’s decision to cancel the gas plant in Mississauga cost the taxpayers millions of dollars.” It is clear that the Liberal government cannot be trusted. They misused tax-payers hard earned money and certainly do not deserve to be re-elected. Mr. Arnott was first elected in 1990 for Wellington County and has been serving in the Ontario Legislature for 23 years. The elections are on Thursday, June 12th. 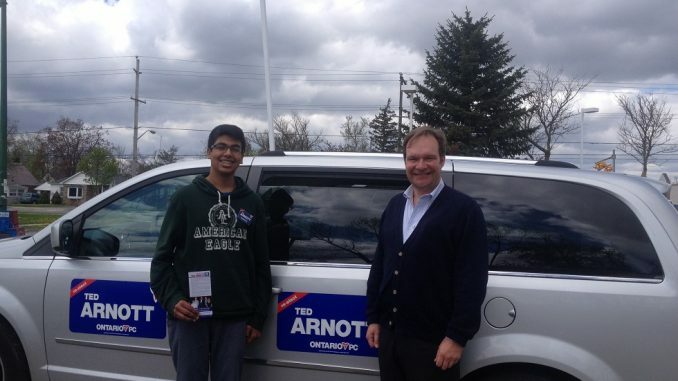 Be sure to vote for Mr. Ted Arnott as he hopes, and we know his greatest contribution is yet to come. We must put Ontario into the hands of a government we can trust. A government who does not lie to the people but assists them and is the PC party! Much has been lost under the Liberal government in Ontario, including jobs. The debt-burden of billions of dollars now on the shoulders of Ontario tax-payers through deceit and corrupt actions is overwhelming! Noone should accept or put up with this. Time for change! So let’s get out there and work together to do what we can to bring about a new Ontario. If you can’t go out – make calls, write, speak it up!